Curley Taylor and Zydeco Trouble will be kicking-off the party at the 4th Annual Mardi Gras on Main. 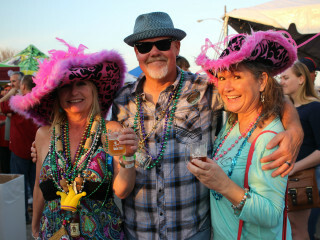 La Porte local, and owner of Brigadoon Brewery, Alan Ward, is again organizing a Mardi Gras Craft Beer Garden that will feature local brewers for guests to sample. Mardi Gras Games will give friends and co-workers a chance to create a team to compete in giant (not)beer pong, trike race, toilet seat toss, king cake eating contest, and 1K beer run. There will also be entertainment for the kids including inflatable slides, face painting, balloonists, a Kid’s Craft Zone, and more.